Heater-Treaters on the rise in North Dakota? Responding to pressure to reduce the volatility of North Dakota crude oil after the train disaster in Lac-Megantic, Quebec in 2013 which killed 47 people and another derailment and fire in North Dakota that same year, the North Dakota Industrial Commission (NDIC) passed standards on December 9, 2014 to require oil-conditioning equipment at the well head to separate production fluids into their gas and liquid components, thereby reducing the volatility of the crude. The standard requires producers to heat crude oil to at least 110 degrees F. at a pressure of 50 psi., effective April 1, 2015. The standard device commonly used to accomplish this is known in the industry as a “heater-treater. See image below. The order requires a Reid Vapor Pressure (RVP) of 13.7 psi. “RVP” is a measure of gasoline volatility indicated in pounds per square inch, the higher the RVP the more quickly it evaporates, RVP at normal atmospheric pressure is 14.7 psi. Just how many heater-treaters may be required is a heated subject of debate between the State regulators and the industry. Two recent State announcements attempt to provide some indication of where things might stand. The North Dakota Department of Mineral Resources has indicated that 80% of Bakken crude has an average RVP of 11.8 psi, less than the requirement and therefore in compliance. 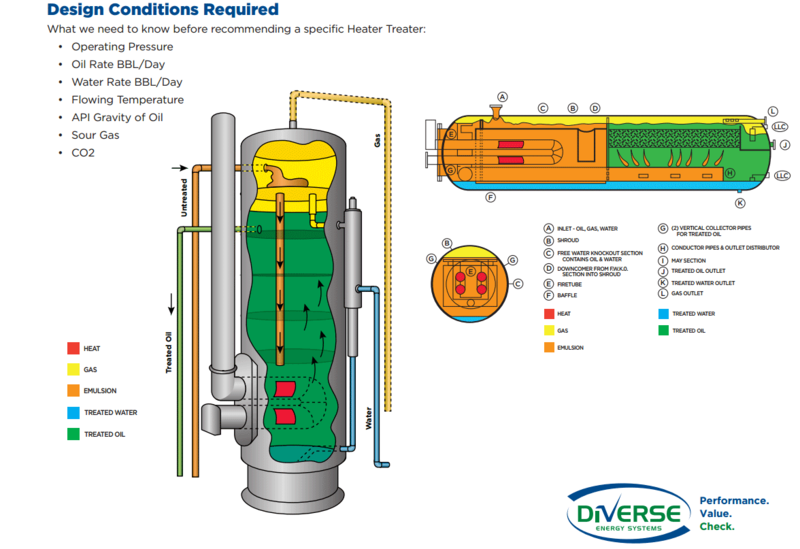 State inspectors recently reported that 55% (165) of the roughly 300 existing heater-treaters operated within the guidelines, 33% (99) were operating at lower temperatures and 12% (36) applied no heat to crude oil. The 12% is believed to represent smaller operators who could be severely impacted by the new rules. The 800 pound gorilla in the room with these statistics though is what percentage of the existing wells have no heater-treaters, potentially a lot more than 300 given the thousands of wells in North Dakota. A search of the DI database for existing directional wells in North Dakota reveals 12,994 directional wells. Accepting the State’s 80% rule and taking only 20% of the 12,994 wells leaves 2599 wells without equipment. To be conservative we will assume as many as 6 wells could be treated with one heater-treater (the number will actually vary depending upon production and equipment capacity) the additional units would total 133 (2599/6 – 300 = 133). If labor and equipment were to run $100,000 per installation costs would be in the neighborhood $13,300,000 to reach compliance. Due to the uncertainty of making accurate predictions of total wells in North Dakota, I chose to use only newer horizontal wells in this example. However a conservative estimate of the total number of active wells in North Dakota would be upwards of 25,000 wells. In which case, the projections herein could easily double. Not to mention the likelihood of wildly varying installation costs, all assumed to be occurring over 90 days in the dead of winter. Alas, as most field disputes in remote areas of the oil patch one can see that this controversy is just beginning. Given the 60% decrease in the price of crude oil in January alone, the only certainty appears to be a bad April Fool’s joke for a lot of operators. As always DI Analytics will be watching the data to sort out fact from fiction as the information becomes available. What Exactly is Condensate and Why is its Export Prohibited? Condensate is a very light hydrocarbon with an American Petroleum Institute (API) specific gravity of greater than 50 degrees and less than 80 degrees. In underground formations condensate can exist separately from the crude oil or dissolved in the crude oil. When produced at the wellhead and run through a stabilizer it is known as “field” or “lease” condensate. In dry gas or condensate wells, condensate remains suspended in the gas stream until separated at gas processing facility, thus earning the name “plant” condensate or “natural gasoline”. FYI, for reporting purposes, the U.S. Energy Information Administration defines lease condensate as crude oil and plant condensate as a natural gas liquid (NGL). The beaker on the left below is plant condensate. With the current explosion in unconventional shale development vastly increasing the quantity of condensate being produced, the domestic market has been overwhelmed. Traditionally field condensate was a preferred source of feedstock for petrochemical refineries. However with the decline in the 1970’s of the lighter grades of crude, domestic refiners switched to refining heavier grades of crude and now have less of a need for lighter feedstock without costly conversions of their facilities. Plant condensate on the other hand was a preferred diluent for blending with heavier Canadian crudes to improve pipeline flow. With these traditional markets now oversupplied, pressure has been growing for the export of condensate to foreign petrochemical users. Unfortunately condensate historically had been considered crude oil and its export had been prohibited since the 1973 Arab oil embargo. In June 2014 Pioneer Natural Resources and Enterprise Products Partners received approval from the Department of Commerce Bureau of Industry and Security to export a limited amount of Eagle Ford condensate which was ruled a “product” and therefore exportable, since it had been processed through a field stabilization unit. See the type of facility below. Field units of his type are rapidly being installed throughout the condensate rich areas of the Eagle Ford highlighted in this map from DI Analytics. Recently BHP Billiton announced their intention to export Eagle Ford condensate without the government’s explicit authorization. No doubt Anadarko, Conoco Phillips and other large Eagle Ford condensate producers cannot be far behind, score one for our balance of trade.